Tag line: "The family that slays together stays together"
Now here’s an interesting slice of ‘80s insanity! Directed by John Hough, American Gothic stars Sarah Torgov as Cynthia, a young woman who, as the movie opens, has just been released from a psychiatric clinic. It seems that, a while back, Cynthia momentarily left her baby unattended in the bathtub, and.. well, I suppose you can guess what happened. To help Cynthia recover from the nervous breakdown this tragedy sparked, her boyfriend Jeff (Mark Erickson), as well as her four closest friends: Terri (Caroline Barclay), Rob (Mark Lindsey Chapman), Lynn (Fiona Hutchinson) and Paul (Stephen Shellen), pile into Jeff’s private plane and head off for what they hope will be a weekend getaway at a peaceful resort. But engine troubles force the plane to land on a small and very remote island. Unable to fix the problem himself, Jeff suggests that Paul remain behind to keep an eye on things while the rest of the group searches for help. Instead of finding a phone or a radio, however, the five stumble upon a house in the middle of nowhere that, from the looks of it, hasn’t changed since the 1920s (the only “modern” convenience is a phonograph). It’s here that the friends meet Pa (Rod Steiger) and Ma (Yvonne De Carlo), the elderly couple that owns the house, who invite them to stay for dinner. Though old-fashioned in their ways (Pa starts off the meal with a prayer, then scolds Lynn for trying to smoke at the dinner table), Pa and Ma also ask Jeff and the others to stay the night, promising that a friend of theirs, due by boat the next morning, will help them any way he can. Things go from strange to downright bizarre, however, when Cynthia is introduced to the Ma and Pa's daughter, Fanny (Janet Wright), who, despite being middle-aged, says she’s preparing to celebrate her 12th birthday! In addition to Fanny, Ma and Pa have two sons, Woody (Michael J. Pollard) and Teddy (William Hootkins), who also act as if they’re still children. And as the confused friends will soon discover, Fanny and the other “kids” aren’t nearly as innocent as they seem. The poster art for American Gothic (which also appears on the DVD cover) recreates artist Grant Wood’s famous painting (also titled American Gothic) in which a farmer and his wife stand, side by side, outside their home. And to be honest, this image is the reason why I wanted to see the film, not because I’m a fan of the original artwork, but because it featured the movie’s two stars, recreating that now-iconic pose. In the right role, Rod Steiger could be an incredible actor (he was extraordinary in On the Waterfront, The Pawnbroker, and In the Heat of the Night), and even when he overacts, he’s fun to watch. As Pa, the hard-nosed patriarch of the family at the heart of American Gothic, Steiger does occasionally go over-the-top (his final speech in the movie is a prime example), but he remains, at all times, the film’s most intimidating character, and whether barking out orders to his sons or scolding his guests for their “ungodly” behavior, Pa is clearly a force to be reckoned with. And then we have Yvonne De Carlo, who, despite roles in such classic movies as Brute Force and The Ten Commandments (not to mention her appearance in 1980’s The Man With Bogart';s Face, a guilty pleasure of mine), will forever, in my mind. be Lily Munster (I liked The Addams Family, but I loved The Munsters). At first, Ma appears to be a kindly old woman, happily inviting her young guests to stay for dinner, but we soon learn she’s every bit as frightening as Pa (she’s handy with her knitting needles, as one poor character quickly learns). 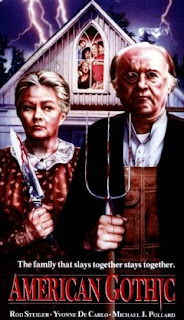 The actors playing their “children” are also quite good (especially Janet Wright as the overgrown Fanny), but it’s Steiger and De Carlo who command our attention, and even though American Gothic is a low-budget horror film, the two veterans still give it their all. A crazy movie with a few interesting twists and turns along the way, American Gothic is an odd, eccentric motion picture that, while not the most frightening horror film you’ll ever see, is just creepy enough to linger in your mind for a while afterwards.